Wind is a natural effect created by the sun’s energy, which pulsates down on us at 175 million watts per hour. That energy hits the ground, heats it, and rises as low pressure that is then sucked up by the air. That suction produces wind. Of course, there is more complicated science involved, but that’s the gist of it. Wind can be a powerful force of energy on its own, so it makes sense that we humans find ways to harness its strength and use it for our greater good. One solution? Wind turbines. And, the good that comes from them is manyfold. Using wind as a source of power doesn’t deplete the earth’s natural resources. Plus, it creates jobs. Queue in the wind turbine technician. The fastest growing field in the world. If you are searching for a career or considering a career change, why not look into becoming a wind turbine tech? Really? Why NOT wind? It doesn’t pollute the environment because it’s part of it. It’s a clean, cheap, and constant source of energy. As long as the sun is in the sky, wind will always be produced. 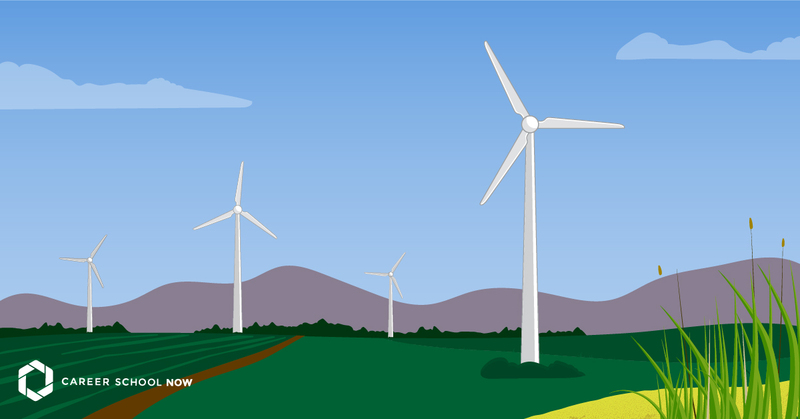 There is enough land to sustain the wind turbines used to turn the wind into power; farms and ranches in particular are the perfect land hosts for the turbines. There are some drawbacks, however. One is that these well-suited properties are usually rurally situated, areas generally further away from the more heavily populated centers where power is needed. So, it can get costly to run the proper transmission lines. Another disadvantage, one which is being looked into, is a way to remedy the wind turbine blade strikes of bats and birds. Even though electricity is far more harmful to the environment the way it’s currently sourced, wildlife conservation is being taken seriously to keep the environmental impact of the wind turbines to a minimum. All in all, wind turbines are not just a lesser of evils. They are more advantageous in more ways than not. WHAT IS A WIND TURBINE? There are various geo-specific factors, from bodies of water to different terrains, that have an effect on the wind flow. What a wind turbine does is to take the available wind from whatever area it is in and create energy out of it. It is a modern day, state-of-the-art windmill. Clusters of turbines are called wind farms. Very often, you’ll drive down a more desolate area of a highway and pass a wind farm standing majestically amidst large fields. There are two different types of turbines: horizontal-axis and vertical-axis. The horizontal-axis turbines are the ones most commonly seen, with the three blades rotating. Vertical-axis turbines resemble an eggbeater. Both types can be used anywhere, land or sea. Currently, the Department of Energy is funding research for offshore wind turbines. 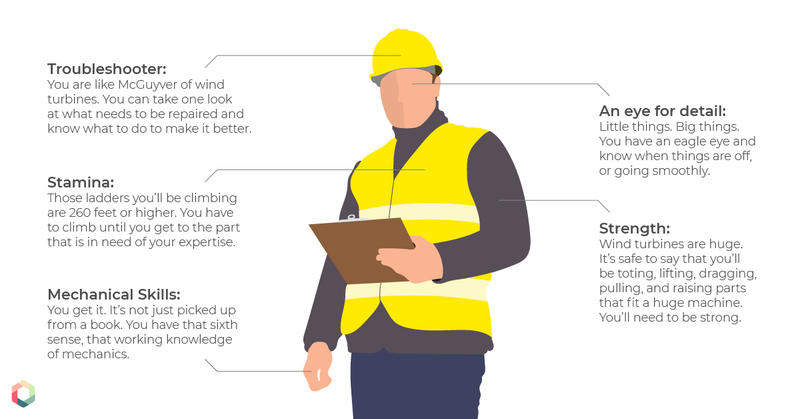 WHAT IS A WIND TURBINE TECHNICIAN? Wind turbines, like most other technology, no matter how advanced, have needs—installation, repairs, and routine maintenance. And, it’s up to the wind turbine technician to make sure these needs are met. Wind turbine techs, also known as “wind-techs,” usually go through technical school to get their trade education. If you already have electrical experience, you may find this career to be a great fit with your skill set. Wind tech training takes two years to complete. In school, you will complete the required classroom coursework. Some schools have their own turbines for students to practice on, and internships prior to graduating may be available. Also, expect a minimum of 12 months of on-the-job training to get you used to the turbines you’ll be working on. Besides the route of community colleges and trade schools, some wind-techs learn their job through an apprenticeship, which is 144 hours of coursework and 2,000 hours of paid training per year. The job of wind turbine tech is considered dangerous, so you really can’t have any fear of heights if you want to safely succeed in this career. Heights aren’t the only thing. You’ll be expected to travel, and you may also have to go to remote and desolate places for extended periods of time. Or, you may have to relocate completely, especially if you are recruited to work for an international company. There are certain personality traits conducive to the career of a wind turbine technician. While they may not make or break your career, having some of these traits will make it easier to find a job in this increasingly competitive field. An eye for detail: Little things. Big things. You have an eagle eye and know when things are off or going smoothly. Mechanical skills: You get it. It’s not just all picked up from a book. You have that sixth sense, that working knowledge of mechanics. Strength: Wind turbines are huge. It’s suffice to say that you’ll be toting, lifting, dragging, pulling, and raising parts that fit a huge machine. You’ll need to be strong. Stamina: Those ladders you’ll be climbing are 260 feet or higher. You have to climb until you get to the part that is in need of your expertise. Troubleshooter: You are like McGuyver of wind turbines. You can take one look at what needs to be repaired and know what to do to make it better. WHY IS IT THE FASTEST GROWING CAREER? Right now, there are over 52,000 wind turbines in the U.S. There are more than 500 manufacturing facilities located in 41 states. At the end of 2016, there were over 341K wind turbines throughout the world, with over 104K of them located in China. These numbers are going to grow, and with it, so are the available positions. The employment growth of wind turbine technicians is expected to grow 96% through 2026. But, this only means an additional 5,500 new jobs. There is only one other career growing faster than Wind Turbine Technician, and that is the Solar Photovoltaic Installer. The median annual salary for wind turbine technicians is $53K, as reported by the Bureau of Labor Statistics. If you’re just starting, you’ll earn closer to the $37K mark, but once you’ve gotten a few years of experience, you’ll be making $80K. However, salaries are very dependent on what state and industry you’re working in. So, whether you’re looking to get into your first career or your final one, wind turbine technician positions are a great idea. You can be a part of a newer, emerging environmentally friendly sector. You’ll feel good about what you’re doing for so many reasons, one of which is that you’re part of a team that is doing wonderful things for humankind and the earth that sustains us. What does an energy technician do?